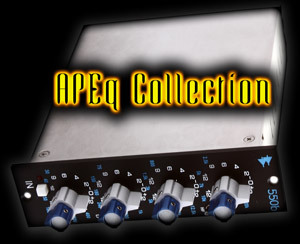 2 different hardware modules, 1 including a preamp (formerly known as "APE Channel") = 3 EQs in total! Additional clean and interpolating programs of each program without wasting additional HDD space! Library size: 57 presets / 540MB! I've checked for several days Your APEQ and have to say that quality wise I was floored by this release. It's by far my favourite A*I eq recreation in digital world ever! I liked the original APE Channel library, but this is really kicking up the quality quite a bit. I love the coloration it imparts; not transparent at all, but it never seems to build up in weird ways like some eq libraries do when I add more than 2 instances. I am loving it. On the APEq Collection I particularly like the fact that I can switch peak/shelf on the same program. That's to me a big plus when compared to libraries from other programmers. First 5 people that send us a short review and suggest a useful DEMO will get our next release for free! Last edited by analoginthebox.com on Sun Dec 16, 2012 3:18 pm, edited 1 time in total. great! can I use the €3 this time in my account balance to pay for the upgrade? Yes! But not automatically. Send me an email (I need you login e-mail). analoginthebox.com wrote: Yes! But not automatically. Send me an email (I need you login e-mail). We have our reasons for not releasing 96kHz. thanks for the great upgrade offer!!! Purchased... Gonna try this baby soon! Yes, I helped test this library, so you may consider my opinions a bit one-sided. But I don't talk well about libraries that I don't like, I would just be silent. This one is awesome. At the price it is right now, it is almost free. This is the finest A*I library to date, in my opinion. And the combo presets are so useful. Personally, I love using multiple instances, the coloration build-up is really really good on this library, unlike some of the older Nebula libraries (in my opinion). analoginthebox.com wrote: Sampled, but not released. This one (or 3+1) reminds me the fun of mixing in 44.1kHz. It's a nice library with various sound at hand. I have purchase a bunch of AITB libraries during the 'non copy protection' era. My question ... what's involved with AITB authorization process? Is this a 1 time check,verify,auth ?? Or do I need an internet connect for verify every time I load a 'protected' library ?? There are no ugly questions. Just an ugly/wrong thread to use for this question. 1-time-check (create .SER, send it in, receive .AUT).